Fruit tarts like these often look better than they taste. You know the ones I mean, with the rock-hard crust, the flabby filling, and the fruit covered with a thick layer of gloopy glaze. I can assure you that these were nothing like that: the crust was crisp, but not too hard, the filling was smooth and creamy, and the fruit was fresh without a layer of glaze. I'd like to take all the credit, but this was a lovely recipe from Dorie. I made 3 individual tarts and shared them with some friends for dessert. They were substantial, but not a crumb was left over. Maybe that's because I only fed them soup and salad for dinner, but I doubt it! I really enjoyed these tarts. I used mango and blackberries to top the tarts, and while the fruit was neither local nor seasonal, it was good. I was tempted to top them with rhubarb, as I picked 10 pounds of it on the weekend, but I wasn't sure how my guests would feel about it. I do have some pastry cream and pastry left over though, so keep your eye on this space for the rhubarb tarts! This week's fantastic pick was chosen by Cristine of Cooking with Christine. She'll have the recipe posted, so do pay her a visit if you want to impress your friends. Or, if you just want to be impressed, check out the Tuesdays with Dorie bakers to what sort of spin they've put on this week's recipe. I bet you'll find some chocolate, and lots of variety in the fruit toppings. I would have never thought to use mangos and blueberries together but it looks so beautiful! What a delicious flavour combo too. Love the vibrant colours!! These were amazing! Hi Mary, I agree - this tart was wonderful, and yours looks so pretty. I do so agree with this one... i'm so terrified of tarts that look the part but taste like a whole bunch of crap put together. Yours looks fantastic for sure! Looking forward to the rhubarb-tarts! P.S. : The colours of your tarts just match perfectly! What a great combo of flavors. It sounds like everyone enjoyed them! Mango sounds very interesting. What a delicious combo with the blackberries! Oooh mangoes and blackberries thats a different combo b ut i bet it went really well together yumm!! 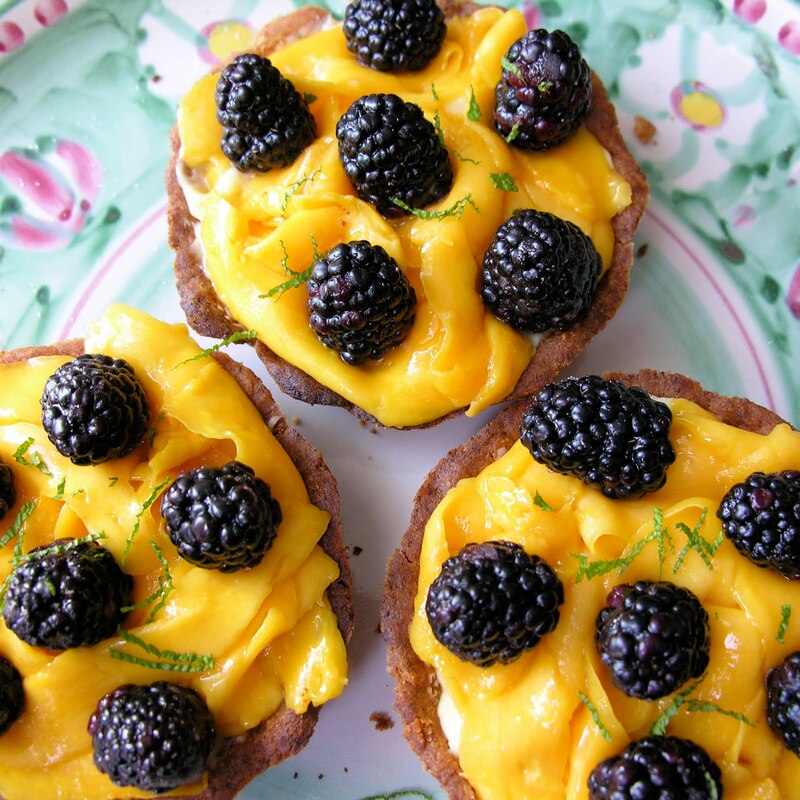 Your tarts look gorgeous! Thanks for baking along with me! Those colors are amazing Mary! What contrast! I thought of you while making those, as I had the idea of putting a little jam under the pastry cream... and of course, rhubarb jam came to mind! But since I had nothing as good around the house, I left it to some other time! I love your fruit combination I'll have to try it sometimes !! Ciao ! These look stunning! I love the combination of mango and blackberries. I used to detest fruit tart, because my parents nearly always got me one for my birthday when I was a kid. I never understood how they hadn't figured out by then that I was a chocolate cake kind of child! Fortunately, I outgrew this dislike. I agree that a good fruit tart is not easy to make. This one looks fabulous, I love the colour combinations! So colorful! I love your pictures. I bet they tasted delicious. I love the way you've draped the magoes over the tarts. Beautiful presentation! Mango and blackberries! Now, why didn't I think of that? Fabulous colors! I wished I could try your mango-blackberry tarts. I bet they were delicious! Oh wow with the mango it looks so beautiful and so yummy! Awesome job! Your tarts are gorgeous. I'll be anxious to hear how they turn out with the rhubarb! Your photos are OUTRAGEOUS! And I LOVE that you used mangoes! Glad to know they work well in this! I tried and failed (unripe mangoes haha!) Gorgeous, gorgeous! uuummmm!!!! Mangos. with blackberries. What a great combo. Looks very summery. Those look great and I'm sure tasted wonderful! beautiful--sunshine in a tart shell! i agree...bakery fruit tarts are usually letdowns. rhubarb would be great with this! The contrast of the blackberries on the mango is just gorgeous! Mango and blackberry, what a delicious combination. oh my gosh. these look fantastic!!! Love the mango and blueberry combo, but dying to hear how the rhubarb comes out. Love me some rhubarb. Those look gorgeous Mary. Mango is such a lovely fruit. I love using it in pavlovas. I read your Drunken Cake post as well. So sorry about the interview! Sounds like the story of my life. I am always rushing around and forgetting calls I am suppose to be making. I've had work clients call me on the school run which is always embarrasing. Anyway that cake looks pretty amazing too! Great combo and I love the colors of it! It certainly looks delicious! Just looking at these and I want to devour one or two! Great looking tarts! I never would have thought of mango...will have to try it next time! They look delicious! I love the color combo with the fruits. Those color contrasts are wonderful! 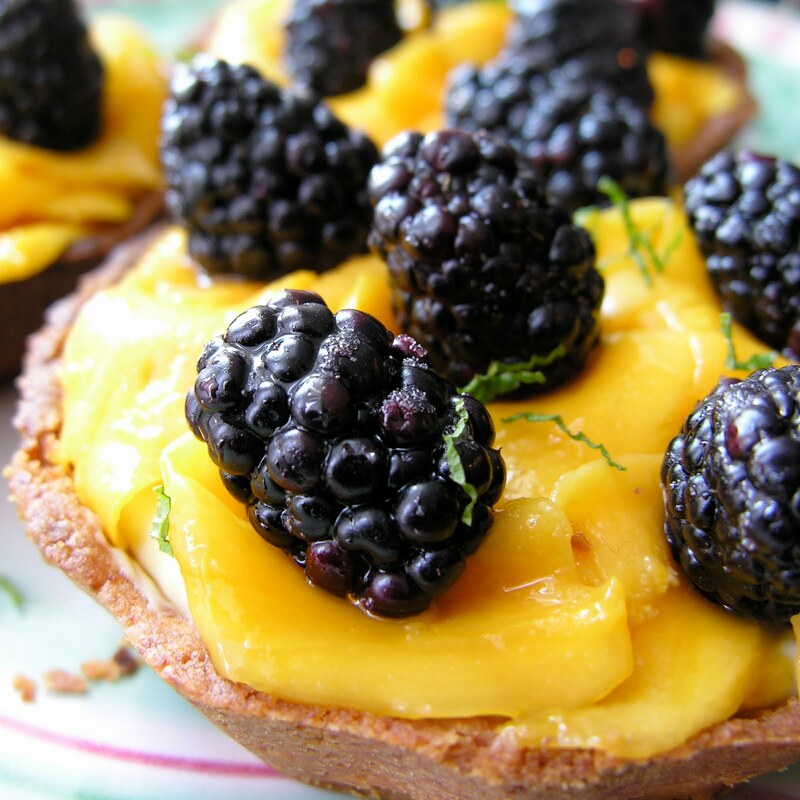 Blackberry and mango - what a wonderful combination - so glad you enjoyed them! Daring Cooks' May Challenge: Enchiladas!